Inspired by our legacy and leadership in racing, RECARO Automotive Seating showcases premium seat concepts that project performance, power and luxury. DETROIT, Jan. 9, 2017 /PRNewswire/ -- RECARO Automotive Seating, a product group of Adient (NYSE: ADNT), unveiled its expanded portfolio of performance seating at the 2017 North American International Auto Show (NAIAS). The highlight of the three new product concepts will be a specially developed concept seat for SUVs. "In the North American market, we are mainly known as a highly specialized seat manufacturer for limited edition and niche vehicles in the high-performance sector," said Ingo Fleischer, vice president global specialty seating for Adient. "With the launch of Adient last Fall, we wanted to use our new, broader positioning within the global automotive seating market to leverage the RECARO Automotive Seating performance culture and expand that into other seating segments. Fleischer added that the RECARO Automotive Seating team is showcasing three new concept seats for different performance segments that present the brand's technical approaches of Composite Seat and Complete Seat. RECARO Automotive Seating's concept seat in the Premium Performance line, designed for SUVs and pickup trucks, combines sporty attitude and performance with driving comfort and is an example of how the RECARO Automotive Seating racing heritage can be applied to SUVs and light trucks. Following comprehensive testing, the concept seat was developed to offer optimized ergonomics and comfort, especially in SUVs. The firm, yet comfortable, feeling of the seats, coupled with exclusive leather, adjustable side bolsters in the backrest and flat seat cushions for easy access, are intended to look, feel and perform as a sport seat for the active lifestyle. "With our design split into a shoulder and a torso shell, the backrest shape provides optimum side support," said Markus Kussmaul, executive director with Adient's specialty seating group "Additionally, the side bolsters in the backrest are adjustable. The flat seat cushion makes access easier. With its multi-level seat heating and cooling, power tilt, height, fore/aft and recline function, integrated headrest, integrated lumbar support, it combines high comfort with RECARO Automotive Seating ergonomics and a pronounced sporty touch." 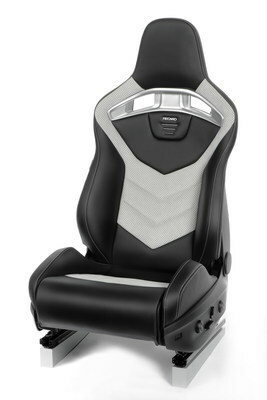 The all-new concept seat representing the Power Performance line offers a perfect match for sports cars or high-performance derivatives of volume-production vehicles and is an example for the concept of applying RECARO Automotive Seating's famous design, foam, trim and ergonomics on an OEM series metal structure. "The RECARO Power Performance concept seat is a perfect balance of performance and daily driving comfort," Kussmaul said. "The seat provides a better connection between the driver and the ride experience of the car, whether it is headed onto the open road or the race track." Kussmaul added that the firm feeling of the upholstery with gripping suede inserts, the pronounced bolstering, shoulder support and the integrated headrest are intended to look, feel and perform as an advanced sport seat should. Seats by RECARO Automotive Seating are ergonomically designed to optimize long-term comfort and safety to support a driver without compromising everyday driving convenience. 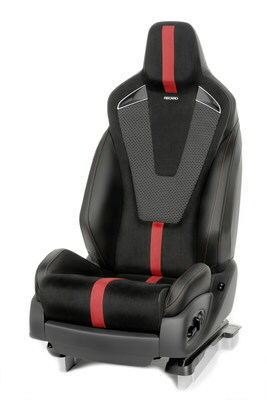 The Power Performance concept seat has a distinct sporty design in black with a deep red center stripe. 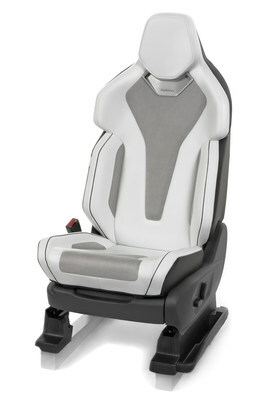 Features of the seat include power-adjustable side bolsters to cradle occupants and hold them firmly in place with driver-seat memory function, four-way lumbar support, power tilt, height, fore/aft and recline function, as well as multi-level seat heating, side airbag and seat occupancy detection. The all-new Luxury Power Performance concept seat is designed for OEM and aftermarket applications. It offers exclusive sportive riding performance, excellent comfort and ergonomics, and is an example of the RECARO Composite Seat solution. The seat features exclusive materials like leather and perforated Alcantara and includes powered adjustment functions like an extendable seat cushion, adjustable side bolsters for maximum support, four-way powered pneumatic lumbar support and a climate package. The derivative of the modular RECARO Sport Seat Platform showcases the all-new Luxury Power Performance seat concept for future platform applications and is an example of the RECARO Complete Seat concept. Both Luxury Power Performance line concepts are designed for premium sports cars that combine high-end sportiness with a maximum of ride comfort. RECARO Automotive Seating will showcase its seat concepts at the Adient exhibit, room 310B of Detroit's Cobo Center. The exhibit will be open to media and invited guests Jan. 9-12, with a press conference held at 6:30 a.m. on Monday, Jan. 9. NAIAS – one of the world's premier automotive exhibitions – opens to the media and industry officials on Monday, Jan. 9. It will open to the public from Saturday, Jan. 14 through Sunday, Jan. 22. For more information, please visit: www.naias.com. Recaro Automotive Seating is a product group of Adient. At eight locations in Germany, Poland, Slovakia, Japan, Mexico, and the USA, we design, manufacture, and market complete seats representative of our core competencies design, ergonomics, craftsmanship, robustness, lightweight construction, and first-class workmanship, under the brand name Recaro. Recaro Automotive Seating consists of two units: While Recaro Car Seating offers passenger car seats for OEMs and the aftermarket, Recaro Commercial Vehicle Seating focuses on commercial vehicle seats in the OEM and aftermarket segments. Adient is a global leader in automotive seating. With 75,000 employees operating 230 manufacturing/assembly plants in 33 countries worldwide, we produce and deliver automotive seating for all vehicle classes and all major OEMs. From complete seating systems to individual components, our expertise spans every step of the automotive seat-making process. Our integrated, in-house skills allow us to take our products from research and design all the way to engineering and manufacturing – and into more than 25 million vehicles every year. For more information on Adient, please visit adient.com.